Recently I have given keynotes at the Plymouth e-Learning Conference (video here .wmv format) and the Technology Enhanced Learning Symposium at DeMontfort University (slides here), both of which explored the flow of technology from shiny innovation through to embedded use within an institutional environment. I did this from the perspective of the individuals/groups involved rather than by describing the evolving affordances of digital platforms. This approach being an attempt to avoid the ‘what’ of technological determinism, concentrating instead on the ‘why’ of institutional/individual motivations. Drawing out the similarities and differences between the geeks gate keeping the BBC Micro in 1982 with the beautiful people (in expensive jeans) ‘life-styling’ the iPad in 2010. Highlighting the daunting breath of activity and motivations that now come under the increasingly useless banner of ‘digital’ by contrasting the excellent Hierarchy of Digital Distractions with the contents of the 2009 GCSE in Information Communications Technology. Asking the audience to reflect on their own personal motivations and positions relative to my ‘Six Very Simple Diagrams’: Role, Desire, Pedagogy, Technology, Motivation and Bickering. Do you see your role as one of successfully embedding technology until it becomes ‘transparent’ or is it more about challenging current practices using the tech as a driver for change? 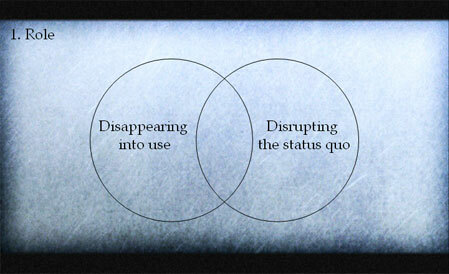 It could of course be a combination but my experience within the Higher Education sector is that groups coalesce around either ‘disappear’ or ‘disrupt’. This, in my opinion, is why individuals who can facilitate communication between these groups are crucial to the ongoing innovation-embedding flow within any institution. The apparent opposition within the disappear-disrupt paradigm was brought back to mind when I was invited to take part in a ‘Does the Technology Matter?’ debate for the ALT-C conference later this year. Inspired by some slightly belligerent Tweeting around the concept by myself, @josiefraser and @mweller Dave Cormier hung the tensions embodied in the statement very elegantly on Smartboards (although he could have chosen any number of technologies) in his ‘It’s about the technology and it isn’t’ post. In the post he neatly balances the push-pull nature of the introduction of new tech into a classroom situation, highlighting what the effects of a new technology can be and what is simply foregrounded by the presence of that technology. For me this aligns well with the disappear-disrupt concept in that your position on this continuum will underpin your reaction to the ‘Does it Matter?’ statement. This brings me to extend the question into a more useful form: ‘Does the Technology Matter for What?’ which does not have an objective answer as it is inextricably linked with ‘What do you Think you are Trying to Achieve?’ Oddly the latter question is often passed over when ‘new’ technologies are being introduced with vague allusions to ‘efficiency’ or ‘it’s what the students want’. Again it’s the ‘what’ not the ‘why’ which tends to get focused on. As an example I would cite the ‘digital literacy’ debate in which motivations to engage frequently go unexplored leading to a focus on how to develop and maintain a successful digital identity as if this is the only way to live and learn. This in turn inevitably moves onto interminable discussions around facebook privacy options that ultimately spiral into the nature of society as a whole until lunch brings the whole thing to an inconclusive finish. Too much ‘what’ morphs into a woolly ‘why’ just as people start to get really hungry. What I’m lobbying for here is a properly balanced conversation around ‘Does the Technology Matter’ in which we avoid simplistic posturing by making it clear what our assumptions and motivations are. In this way the discussion will help us to reflect on our own positions and how we can successfully collaborate with those around us who hold differing views but might well be trying to achive similar things. I’m not saying that I’d-like-to-teach-the-world-to-sing I just think that our underlying approach to technology is still a little 1982 and it’s time to accept that the picture is a bit more complex.